Photos courtesy of George Beppu. In this controversial match, Curtis Iaukea recaptured the United States Championship by defeating Handsome Johnny Barend in two straight falls at the HIC Arena. Barend started out the match by viciously attacking Iaukea with blows to the forehead until Iaukea started bleeding. 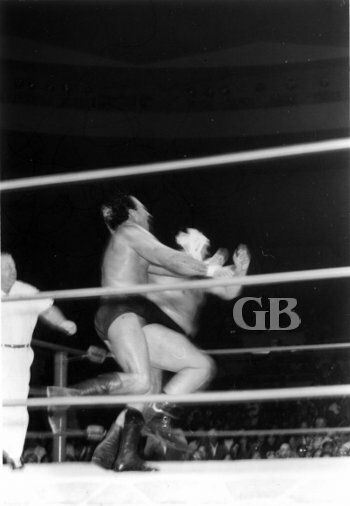 Barend continued the onslaught and, one at a time, dragged Curtis to all four corners of the ring, each time leaping from the top turnbuckle and landing a knee drop onto a prone Curtis Iaukea's chest. 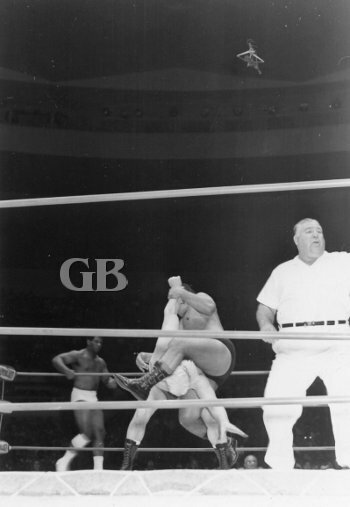 Referee Wally Tsutsumi prevents The Skull from using a foreign object against Karl Gotch. Cyclone Negra delivers some crippling head butts on a slumping Ripper Collins. Eddie Morro confronts World Tag Team Champions Ray Stevens and Patt Patterson. Jim Hady applies the Octopus submission hold on Patt Patterson. Johnny Barend stomps on Curtis Iaukea on the mat apron. Barend would not let up the attack and ignored the referee's attempt to bring order to the match. Eventually, the referee was forced to disqualify him, giving Iaukea the first fall. Barend works on Iaukea's forehead while the referee counts. After the bell rang for the start of the second fall, Iaukea was still out and could not continue. Ed Francis intervened and allowed Curtis to go into the locker room for some first aid. Barend protested and felt he should be awarded the match and championship then and there. He brought his displeasure to the crowd, working his way around the ring, seeking out support from the fans. This went on for several minutes. A bandaged Curtis Iaukea reappears from the lockerroom and attacks Johnny Barend from behind. Meanwhile a dazed Curtis Iaukea, his head heavily bandaged, silently returned to the ring and attacked Barend from behind. He then slammed Barend to the mat and finished him with the Big Splash. Curtis Iaukea had taken two straight falls from Johnny Barend and had recaptured the U.S. title.